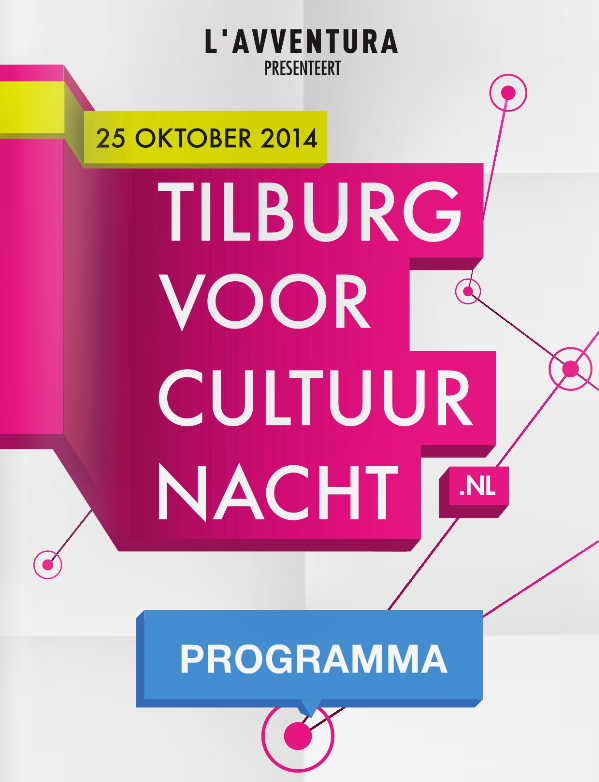 On Saturday, October 25, 2014 there will be another Cultuurnacht (Culture Night). This issue is called TilburgvoorCultuurNACHT and is organized by L'Avventura Tilburg in close cooperation with the platform Tilburg For Culture. In Park there will be a Cultural Café as the kickoff of the Cultuurnacht. From approximately 17.45 hours wristbands are sold at Park that allow access to all other activities of the Cultuurnacht. The entrance to Park itself is free. The Cultural Café is hosted by Toine van Corven and Esther Porcelijn. - 6 pm Kickoff by alderman Marcelle Hendrickx, she is main guest and is interviewed by Toine van Corven. - followed by a discussion about Art in Public Space, including Rob Moonen and Sander Neijnens. - 7 pm acoustic concert by Tilburg duo Aart Strootman and Bram Stadhouders, they will play parts of their new CD. - followed by a discussion on immigrant Tilburg inhabitants and their culture visit, including Hulya Cigdem and Roy Pieters. - In addition, the exhibition Maria Hemels Blauw (Mary Heavenly Blue) can be seen, with works by Atelier Artenzo, Niels Broszat, Pavel van Houten, Claudy Jongstra, Jorn van Leeuwen, Marc Mulders, Olphaert den Otter, Josine Timmer and Reinoud van Vught. Niels Broszat recently received the Royal Prize for Painting 2014 from King William Alexander. He shows 22 works in Park now. Of course there is also the opportunity to chat over a drink afterwards. PARK will be open until 8.30 pm.